These images show you how to tell the age of a deer, but there's one important step to do first. When we hunt the same are for a long period of time, there's always that one buck or two that either stays out of our range or gets passed up each hunting season. Either way, we know it's been there for years. But how many years? How do you tell the age of a deer? Is it a super mature buck, or a younger deer with a big buck's body? It's not that difficult to age deer, but it's also not strictly body characteristics or antler growth (or even antler size) like most people think it is. You have to check a deer's teeth. Now, we're betting most deer in your area wouldn't sit back in a dentist chair, open wide, and let you peer into their gullet to count molars. It's going to take a harvest to determine a deer's age with this method, so if you don't shoot and kill the thing first, it's tough to get an exact deer age. Thanks to the wildlife biologists at the Michigan Department of Natural Resources, we've got a pretty helpful guide. Though it's specified for Michigan deer, we're betting the same principles can apply to any region's deer, and you'll at least end up with a close estimate. Take a look at this diagram, it's what you'll use as a guide to determine a deer's age. Pay close attention to the molars and the premolars. In a fawn less than a year old, you'll find four total cheek teeth, with three premolars and one molar. If a deer has passed its first birthday, its temporary premolars are present, with the fourth one three-parted. Remember than premolar number one is actually non-existent, so start with number two. A dentine line will show up around this point, and can be studied to closer estimate the age of a deer. As a deer continues growing through its second year of life, its permanent premolars are lost and replaced, much like our baby teeth drop out in our younger years. Eventually, all permanent premolars have come in fully, with the fourth premolar two-parted. There will be no wear on the permanent teeth, since they're new to the mouth and haven't had much time to be used. Lingual crests, or the pointy ends of molars, are sharp when the teeth first arrive. Moving on, a deer that has reached age 4 will have worn down its lingual crests of the first molar. The dentine line goes from buccal to lingual crest, and the third and fourth premolars are showing wear. As deer get older their molars and premolars continue to wear, and lingual crests can all but disappear on certain teeth. 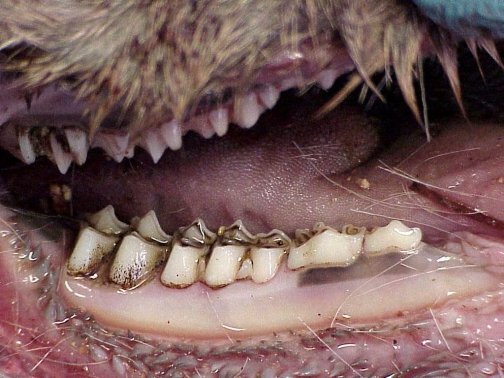 From age 6 to age 8, deer usually will have completely worn down their fourth premolar and first molar flat. The third molar will retain its lingual crest. If deer get much older than that, they're beginning to be considered elderly. Their teeth will prove it. The third molar will likely be the last remaining tooth with a lingual crest somewhat intact, and the rest will be nearly flattened. Discoloration is high and the last remaining years of the deer's life will be spent chewing with some pretty gnarly-looking teeth. Now that you have an idea of how to determine a deer's age, you'll be able to check and give it a closer-than-ballpark range of years, and know about how long its been grazing, bedding and breeding in your area. It's not an exact age, but it's an educated guess. If you've got a good mix of age classes, then you've more than likely got a healthy deer herd. Seeing big boys with a lot of body weight is great, but it can mean different things, not necessarily a high age. Of course, you do have to connect with your rifle or bow first. But when you do, you'll at least know that aging deer this way will give you a good idea.